Ya Jagoff!!! | #YaJagoffPodcast / Picklesburgh: A Big ‘Dill’ for Jagoffs! Home YaJagoff Podcast #YaJagoffPodcast / Picklesburgh: A Big ‘Dill’ for Jagoffs! #YaJagoffPodcast / Picklesburgh: A Big ‘Dill’ for Jagoffs! Summary: The Jagoff duo headed to the Clemente Bridge for the 4th annual Picklesburgh celebration of all things pickles. From bacon coated delights to juice drinking contests and even some pickle-flavored whiskey, this event never disappoints. We chatted with Leigh White of Pittsburgh Downtown Partnership about the progression of the green scene, as well as Mairin Petrone of the other green scene: The Pittsburgh Irish Festival. Listen to this episode by clicking on the play button below. Don’t see the player button, above, in your email? Click the one below to listen while you Christmas-in-July shop!! Question of the Day: When eating pickles and the juice dribbles, do you use a napkin, shirt, or back of the hand to wipe away? What was on the blog last week? Lots of Pgh celebs cruising in a car with us jagoffs for a cause. GET YOUR GREEN READY: The YaJagoff podcast doesn’t want to leave listeners green with envy as we prepare for the Irish Festival THIS September at the Riverplex at Sandcastle. Enjoy custom and tradition at its finest while listening to national and local Irish performers including a visit from international sensations, The Screaming Orphans. Plus, eat, drink, shop, dance and do some Ancient Celtic Axe Throwing as we celebrate the Pittsburgh Irish Festival. Visit pghirishfestival.org for details and ticket information. Best part- you don’t have to be Irish to have fun at the Festival. 6:06 Mairin Petrone: Mairin steps away from the Pittsburgh Irish Festival tent serving bacon, cheese and hotdog pickles to talk about the staples at the Irish Festival in September like geneology, crafting and great Irish food as well as new options like axe throwing and a visit from the Pukas. Plus, expect the pickle at the Irish Festival! 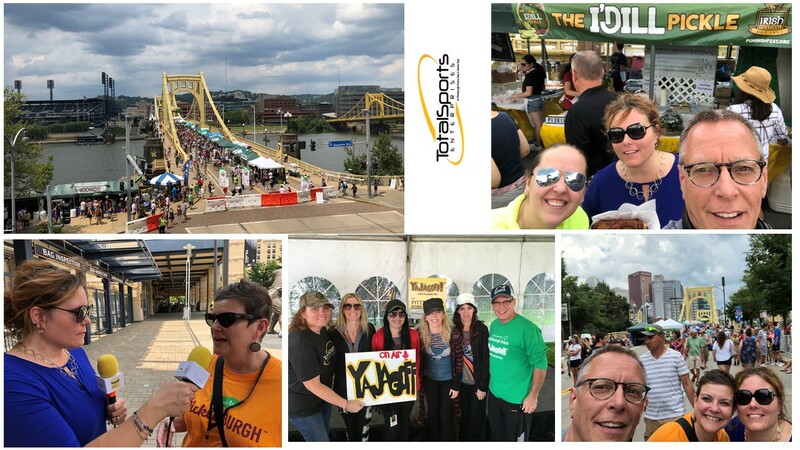 18:27 Leigh White: As soon as the PDP began the festivities on Friday, a crowd of folks stormed the bridge to get a taste of Picklesburgh, an estimated 75K pickleheads that is. While Leigh proudly owns the pickle frenzy, she explains that it is not a trend since many downtown restaurants serve the pickle in unique ways year round. 36:07 The Screaming Orphans: Originally recorded at last year’s Pittsburgh Irish Festival. The ladies are hysterical as they attempt some Pittsburghese! Get their music! Proud to announce a new listening platform on The Rivers Edge! Previous articleCubs Fan Steals Baseball from Kid During Game – ON TV!! Is Waste Management REALLY Managed?